These are recently taken pictures from a replica factory in Luoyang, Honan Province, China. They are advertised and sold as such by the factory, at about US $30 a piece and delivered covered by "original clay". Unfortunately there are no telling what they will appear as later on. Tang pottery figures could right now be found at more modest prices than in a long while. The reasons for the fall of price are several. Most important are that all construction activities which are going on in China right now, are tearing up the ground at places that previously would have been considered sacred. Another reason is that genuine Tang pottery are thought as being hard to identify and the scientific tests (TL-tests) needed to authenticate an old pottery piece are expensive. A cost that will add some US 500-1000 to the price of any piece tested. Today an important Tang piece is next to impossibly to sell without a TL-test which gives us a base price at US $ 500-1000/apiece plus the cost of the figure itself. The elegant, san cai "three glazes" Tang horses have for some time been something of a collectors favorite must have and there are many fakes around. The replica industry is today turning their attention to less well-known shapes. It is not that easy to make a reliable TL-test. Samples must be taken from the piece which leaves ugly holes, and the fakers are aware of where on a piece such holes could be drilled and might therefor have inserted just a small piece of genuine Tang clay there and only there - with the rest - being new. The favorite spot on horses being the flat base or around the hole in the bottom part of the body. To put too much trust in a technical test without paying real attention to style might therefore turn out to be a long and expensive way around the problem leaving you with ugly holes, a worthless paper and a fake horse. I might be sticking my head out again, but contrary to this, I would say that Tang pottery figures are not harder to recognize than any other Chinese ceramics. I would say it is easier to see if an alleged Tang pottery piece is genuine than most other pieces of Chinese pottery and porcelain. In fact, genuine Tang clay and one thousand years old lead glazes are not that easy to copy and could be readily recognized once you have had few genuine specimens to compare with. The reasons for this are also several. Tang figures had very little value before the end of the 19th century, when the westerners started to collect them. We could therefore expect there to be no or at least very few "in-between" pieces made halfway down the history. They are either Tang - or 19th-20th century. That is it. I whish we could say that about other areas of Chinese pottery and porcelain. First - of course you do need to know the style, look and feel of genuine pieces. There is no way around that. One very common way to "fake" a technically genuine Tang pottery piece that would stand up against a TL-test is to assemble one complete figure out of broken parts of several other pieces, which did not belong together in the first place. You can get to see the weirdest shapes once you have got your eyes opened for this. Please note that a TL-test will not reveal anything wrong with an assembled piece. The second most dangerous fake is to take one part of a genuine piece and add all missing parts with newly made. A TL-test will not reveal anything wrong with these kind of assembled pieces either if the samples are only taken from the old parts of the figure, normally any unglazed parts. A really pathetic trick by the fake peddlers is to take a brand new piece, smash it up - maybe break the neck off of it - and then make a sloppy and obvious repair. Sometimes somebody must have said that repairs are a good sign of authenticity, and there you are. Long before the TL-tests were invented, dealers, collectors, and archaeologist had learnt a few tricks that I now am about to tell you. If you know them you can suddenly be in the position to buy very inexpensive, genuine but not tested Tang pottery pieces, at most favorable prices - and with very little competition. First - old Tang dynasty fired clay feels different from newly fired clay. 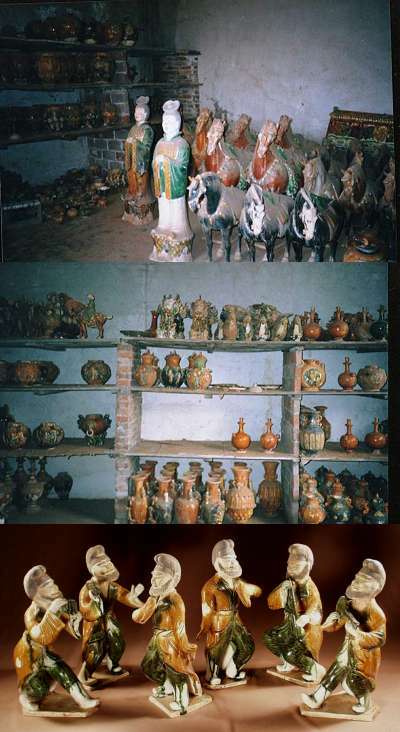 Fakes are most often "sharp" on all exposed areas whereas Tang pottery have a soft touch. Secondly - the lead glaze have usually degraded over the years in a way that is very hard to replicate. Technically the glaze will have stalked itself up into thin layers, which are seen, as if the glaze was covered by salt. (Beware - it might be). It should have a very fine meshed crackle. Each of this are possibly to replicate but rarely both, at the same time. Thirdly, The best trick are still to check water absorbency and how the figure smells when it is moist! Genuine Tang pottery absorbs water, or moist, very easily, and when moist the piece gives off a very special acrid smell of old earth. The weak point (beside the fact that I am telling this here and now for the future fakers to read) is that I don't know how many times this smell trick works on the same piece, since the smell is really 1000 years old air getting pressed out of the antique pottery figure. Another weak point as has been pointed out to me that the clay often covering the pieces also could give off a very "old" smell. Still, a preliminary test that will give you a good clue is just to wet the tip of your finger and press it against any unglazed part of the figure. If the moist soaks up instantaneously and leave a dark spot, you can be almost sure the figure is old if everything else seems ok. If completely soaked a Tang or older piece will take 2-3 days to get completely dry again. A recent pottery piece does not absorb by far that much water. Why is this, then? Well, Tang pottery figures were never intended to be used, or be seen again, ever, actually. The figures were to accompany the Emperor and the high officials of the court to the other world to give them prestige in front of the Heavenly Emperor. This was utterly important to the relatives since they would in time sacrifice to their forefathers and ask them for help. Therefore, how much help they could expect to get would of course depend on how much weight the forefathers could through around to make things happen - same in the next world, as in this. Anyway, because of the expected limited wear and tear of the figures the potters did not waste more than an absolute minimum of fuel to fire the pieces. Modern potters seems to overlook this and fire their pieces at higher temperatures than the old ones. If they actually use a different clay is beyond me to tell but I doubt that. An extra bonus with this absorption trick is that you in the same time can see if there has been any repairs done - since the repairs usually gets clearly visibly against the dark, wet, original, clay. I have studied several Tang pieces in this way - fakes and real - and compared them to the TL test results, so I am confident these simple tests will give you a good base to stand on. Of course, there is no way for me to guarantee anything - and exceptions are the rule in Chinese pottery and porcelain. My ambition has just been to tell you some of the tricks of the trade. However, try this out yourself - and mail me your opinions and experiences. A word of warning though - lot of real Tang pottery were painted with unfired paint - and this can easily be damaged if you actually soak them. Do not dip them in the tub. My suggestion is that you use a spray bottle - on of those used for showering flowers leafs indoors and your judgement.